The younger was born January 25, 1822 in Glens Falls, New York, about 3-miles away; his father was a toll collector who worked on a toll booth in the middle of the Hudson River. Glens Falls was later known as “Hometown USA,” a title given to it by Look Magazine in 1944. The younger didn’t have much schooling, attending Glens Falls Academy for 7th and 8th grades, his only years of formal schooling. After leaving school, he was a clerk for Nelson J Warren, the largest business in Warrensburgh, New York. He learns bartering, bookkeeping, taking inventory, maintenance and janitorial duties. At about the age of 20 (in 1842,) the younger worked as a bookkeeper and head clerk for Charles Dewey in the Old Stone Store in Sandy Hill about 3 miles from Glens Falls. It was here the two met. Dewey was a brother-in-law of the older. Later, the older’s sister, Eliza, married the younger’s uncle, Linus. The older suffered from recurring tuberculosis and sought a better place to live. The younger looked to broaden his horizons. In early 1846, they planned a trip to the Oregon Territory, the older seeking to practice law, the young to survey land. After acquiring the “Louisiana Purchase” in 1803, under the directive of President Thomas Jefferson, the Lewis and Clark Expedition, also known as the “Corps of Discovery Expedition” (1804–1806,) was the first transcontinental expedition to the Pacific coast undertaken by the US. Later, Manifest Destiny was the widely held belief that American settlers were destined to expand throughout the continent. Journalist John L O’Sullivan wrote an article in 1839 and predicted a “divine destiny” for the United States. By 1843, increased American immigration on the Oregon Trail to the Oregon Territory made of the border between the US and Canada an issue in Congress. On June 18, 1846, they voted on the 49-degree line as the border between Canada and the US. Rather than walk, the two sailed on the ‘Henry,’ leaving February 23, 1846. After a long and stormy voyage – rather than continuing to Oregon Territory – the ‘Henry’ limped into Honolulu Harbor on October 12, 1846, needing extensive repairs. After some persuasion, he consented to stay, provided his friend could also be provided with employment. The younger first worked at Ladd & Company, a mercantile and trading establishment, then at the US Consulate in Honolulu. They didn’t plan to go to Hawaiʻi, let alone stay there; but they did. The older encouraged and convinced the younger to stay. He did; in fact, in 1849, the younger became a naturalized citizen and signed an oath to “support the Constitution and Laws of the Hawaiian Islands”. The two left lasting legacies in the Islands. 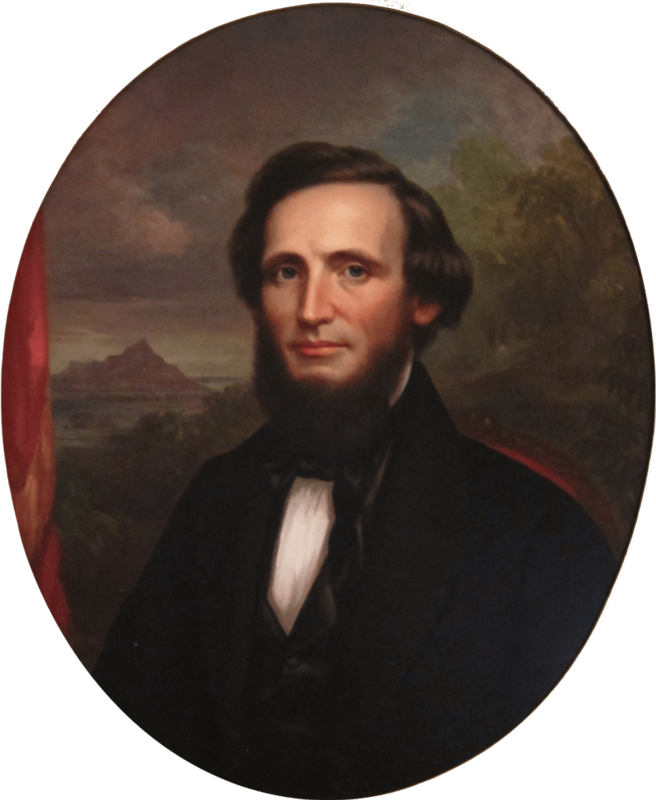 Lee brought major areas of substantive Western law into the Hawaiian legal system by drafting legislation which was frequently passed without alteration. The younger of the two, Charles Reed Bishop, was primarily a banker (he has been referred to as “Hawaiʻi’s First Banker.”) An astute financial businessman, he became one of the wealthiest men in the kingdom from banking, agriculture, real estate and other investments. He met Bernice Pauahi while she was still a student at the Chiefs’ Children’s School (they probably met during the early half of 1847,) and despite the opposition of Pauahi’s parents who wanted her to marry Lot Kapuāiwa (later, Kamehameha V,) Bishop courted and married Pauahi in 1850. Bishop’s industrious nature and good counsel in many fields were also highly valued by Hawaiian and foreign residents alike. He was made a lifetime member of the House of Nobles and appointed to the Privy Council. He served Kings Kamehameha IV, Kamehameha V, Lunalilo and Kalākaua in a variety of positions such as: foreign minister; president of the board of education; and chairman of the legislative finance committee. King in his executive capacity should not control the decisions of the judges. Following this, Lee presided over the Superior Court of Law and Equity (this court was later elevated to become the Supreme Court.) Lee served as Chief Justice (the Islands’ first CJ,) Lorrin Andrews and John ʻĪʻi as associate justices. The three justices heard all cases of original or appellate jurisdiction above the district court level. Lee was appointed to the Privy Council. As Chief Justice, first of the Superior Court (1847-52) and then the Supreme Court (1852-57,) Lee administered the court system. He created the position of clerks in the Supreme and Circuit courts and placed them under centralized control. By the time of the 1852 Constitution, aliʻi authority combined with Western precedents to create a Hawaiian judicial system that was Western in philosophy, structure and procedure. Judge Lee’s health, always delicate, gave way as a result of undue exposure in attendance upon sick natives during an epidemic of smallpox in 1853. The image shows William Little Lee. In addition, I have included other images in a folder of like name in the Photos section on my Facebook and Google+ pages.